LIFE IN LIGHT, Dichroic glass, stainless steel, 6’ x 6’ x 48’. Commissioned by University Health Sciences for Clinical Sevices Building at Brady Green Hospital Downtown San Antonio. 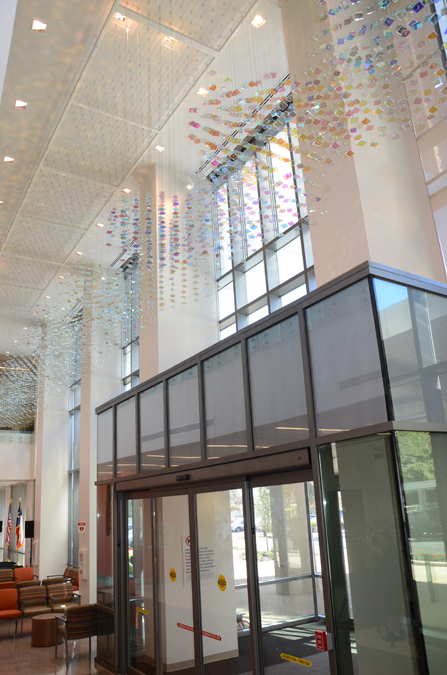 Composed of 4,500 2”x2” laminated dichroic glass squares suspended in a 2 story atrium. Pieces form a volumetric depiction of 2 strands of DNA intertwining around each other.